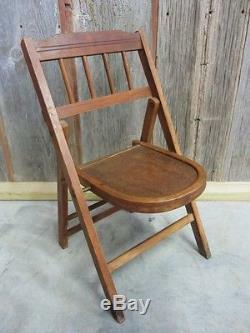 Vintage Wooden Folding Chair > Antique Table Stand Old Stool Chairs RARE 7039. This chair has a very unique seat design with the rounded front. It has a lever which latches the seat in position. You have to push the lever to release it to you can fold it. The chair measures 28 tall to the top of the back when in the fold out position. The seat is 12" x 10 1/4" and is 13 off the floor. Good condition for its age. It has some moderate to severe wear and staining. There is a small piece missing from the back seat support, see pictures. It is still quite solid. This is one fine old collectible. See description above for further info on the condition. The item "Vintage Wooden Folding Chair Antique Table Stand Old Stool Chairs RARE 7039" is in sale since Sunday, April 15, 2012. This item is in the category "Antiques\Furniture\Chairs\1900-1950". The seller is "*miliki*" and is located in Red Oak, Iowa. This item can be shipped to United States.